Now that summer is finally over its time to look back through the rain at what happened last weekend. Becca’s Belles made their way on Friday to Druids Glen golf course to try and find the Greystones wicket. Once there they had a bit of a bat with Leslie top scoring in her first ever game as the 3rds with all their newbies scored 85 runs. That total may have seemed a bit low but not when you have Ash Carty (3 wickets for 5 runs!) and Becca (3 for 15) bowling in tandem to skittle Greystones. Great win for a team enjoying themselves immensely and that could set them up for the playoffs. And a big thank you to Graham Mooney for umpiring – he may have thought that his first year in Pembroke would see him easing in gradually but not a chance, he’s been omnipresent as player, umpire, driver and photographer. Whatever transfer fee we paid Phoenix was a bargain. Saturday saw Tony opening the clubhouse for the early risers to watch the Lions roar for half a game against the All Blacks. Liam Williams followed up creating one of the great Lions tries with dropping the ball so many times that he’s now an automatic choice for Dave O’Riordan’s 3rds. D4 Deli obliged with breakfast rolls for the 12 or so athletes that graced the clubhouse – there was more tomato ketchup on show than in a Christopher Lee movie and more mustard than a game of Cluedo. Wild Bill gave a running commentary that seemed to consist of nothing but expletives – I’m not entirely sure Bill McLaren would have approved. Wild then remained lounging in his seat for the rest of the day giving pretty much the same commentary to whatever was on the TV – Women’s World Cup cricket, Formula 1, GAA and Mass from the Pro Cathedral. If Heatley Tector is looking for a co-commentator for his next live cricket broadcast I know just the person. 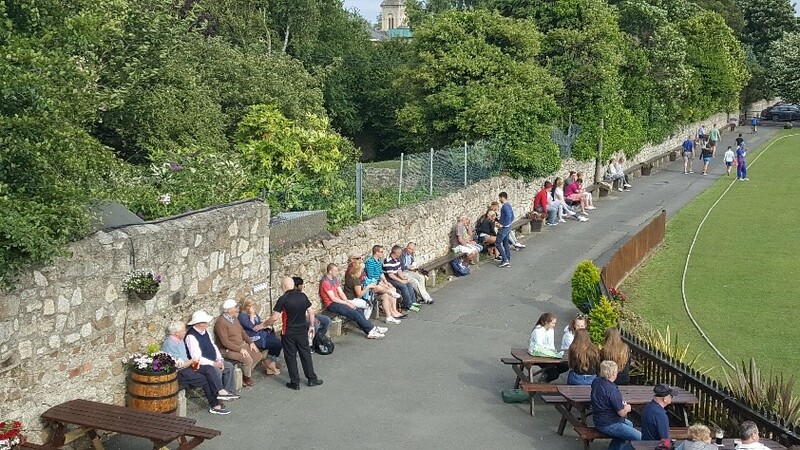 It was also an early start for the Men’s 1sts as they welcomed both Cork County and North Kildare to play in the first series of the Alan Murray round robin games. There was a murky, damp start to the first game against Cork as we batted first. Our top 3 were soon back on the bench but some positive and powerful hitting by Lorcan, Hoppo and Jack along with a generous 10 wides saw us reach 147 off our 20 overs. Whatever chance Cork thought they had chasing down that total was very quickly dispelled by some fast, hostile and accurate bowling from Josh (2 wickets for 8) and Hoppo (1 for 17) before the spinners mopped up the rest – Paul with 1 wicket, Benn with 2 and JJ with an excellent 3 wickets for 16 runs – Cork ending on 91 for 9 off 20 overs. The interval game between North Kildare and Cork had a similar result with Cork all out for 87 chasing 147. The final game of the series was played under blue skies and a hot sun with a full wall sufficiently hydrated thanks to Tony and Con. A word of warning when using the visa machine – make sure the Cash Back option is selected (either yes or no depending on whether you want cash back or not) otherwise if you input your PIN it will show up on the sub-total line – thanks to Con for pointing it out and I’ve changed my PIN now! Batting first again, this time our openers piled on the runs – Diarmuid with 44 off 41 balls and Nick with 92 off 50! Quickfire cameos from Lorcan and Hoppo – 21 runs each off very few and 14 runs off 6 balls from Josh (with a couple of reverse sweeps for 6 – think there may have been a bet on there) saw us make 199 from 20 overs. North Kildare made a decent attempt at getting the runs but were all out for 134. Wickets for Paul, Benn, Jack, Hoppo and another 3 for JJ did the damage helped by a stunning full length diving catch from Sanil – he’s got to be in line for the next Spiderman movie. 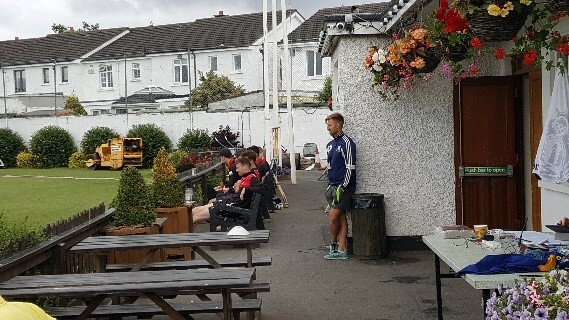 Meanwhile the Men’s 3rds were banished to West Dublin with their GPS trackers desperately trying to find the Adamstown pitch. Once they waded through the long grass, led by David “Livingstone” O’Riordan, they decided to have first go on the mat. Scoring a creditable 217, with runs for the skipper, Declan, Faran, Kavs and Achmat they then set out to defend the total. What happened next should remain buried wherever they keep all those Fatima secrets but suffice to say that the Adamstown opener scored 146 not out, which is roughly 14 runs for each dropped catch. Wiz emerged with a creditable 2 wickets for 24 in 8 overs and thankfully the bar was open when they trekked back from the wilderness. Paddy Gallagher came back from Luxembourg for the 3rds game and his parents had to make an appointment with him for lunch in the club the following day, which he managed to attend before jetting back to tax exile. 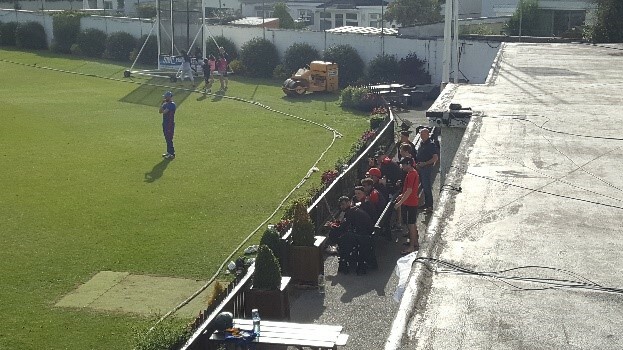 On Sunday we had the rearranged Leinster Senior Cup quarter-final against Railway (nominally their home game as their place is still a builders yard) and we were invaded by O’Briens as the sun came out again. We were missing Andy due to medical complications with his ‘glute’ (the expert diagnosis is that he’s suffering from a pain in the…) but otherwise were at full strength. Railway batted first and although they were 52 for 4, a couple of stubborn partnerships got them to 179 all out. All our bowlers took wickets with Hoppo and JJ taking 3 each – JJ is nothing if not consistent! Unfortunately, our batting did not fire and we lost wickets at regular intervals ending up all out for 117, a disappointing end to the weekend. Our innings also showed how the lure of the bar can even get to the officials with JJ given run-out in one of the most head-scratching incidents that I have seen. The umpire enjoyed his pint afterwards so I suppose that’s all that counts in the end. A change of scene on Monday as I took Noah and Macdara to represent the club in an invitational game against Ampleforth College in Oak Hill, the modest home of Peter Savill and host to many daylight raves over the years. Both boys acquitted themselves well with runs and wickets and thoroughly enjoyed the jam sandwiches on offer. I was impressed by the ground on my first visit and next time I’m down I’m taking home a pheasant for tea. 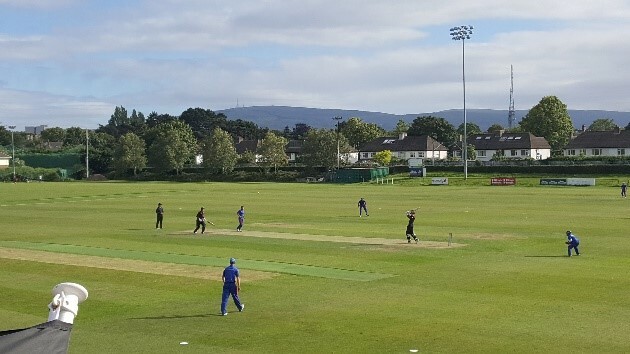 While the international was going on in Oak Hill, our Girls Under 15s were winning their cup game against Malahide – I don’t have any details but I promise to try and make their next game and give a report. Tuesday saw us with the U13 boys at home to Railway (more O’Briens invading) while the Men’s 1sts had a Div 1 T20 refix in Clontarf. 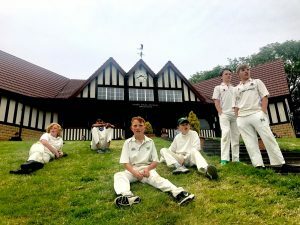 It was the last of our summer days and our U13s batted first against some very tight bowling – most of the top order got a start with Noah retiring on 30 (proud dad moment, despite my Facebook post!). Unfortunately, the Railway reply was quite emphatic as we struggled to contain some heavy hitters but Lexi again was the pick of the bowlers and its great to see a leg spinner sticking to his task despite being unlucky not to get more wickets. Meanwhile, we followed the game in Clontarf on the Live Score or we would have done if it was working. Maybe it’s a blessing that it wasn’t as we lost by 66 runs. First up is a Div 8 T20 refix as the Intrepid 4ths follow the same trail as the Men’s 3rds to Adamstown this evening for a 6pm start. Also this evening the Ladies 2nds are home to The Hills at 6.30pm, if it isn’t too dark by then.It’s a packed day on Saturday, with Tony on early duty to open the Clubhouse for the pride of Lions supporters with D4 Deli on speed-dial again for breakfast rolls and Wild Bill on running commentary (sorry folks, he doesn’t come with a mute button). Around the time the Lions are getting beaten, our Girls Under 13s are in the 2nd round of the Cup at home to Merrion so I would hope the Lions fans stick their heads out the door to shout encouragement (Wild can stay in the Clubhouse), at the same time, the Under 11 boys have a cup semi-final in Leinster. Meanwhile the Men’s 1sts have the second series of Alan Murray games, this time in Anglesea Road. They start at 10.30am against Merrion and follow that by playing Malahide at 2pm. By the time they finish the latter game they will have a choice of following the Livingstone’s trail to Leinster for the Men’s 3rds Middle Cup quarter-final or heading to Pembroke to watch the Furious Fives take on Bagenalstown in a Div 13 game – both games start at 1pm. On Sunday the Boys U11C team kick us off with a trip to North Kildare at 10am, while the Intrepid 4ths continue their travels this time to Ringcommons in the Middle 2 Cup quarter final. Dale’s 2nds play in the rearranged Senior 2 Cup at home to Leinster starting at 1pm. Wednesday sees the Boys U17s at home to North Kildare and the Girls U13 away to Merrion while on Thursday the Ladies 2nds head up the road to Merrion for their league game. Once again, please make a big effort to come out and support your club, particularly the younger teams as it is always appreciated. A belated happy anniversary to Banners and Nicolette – one year not out and Nicolette still can’t speak Nordie. 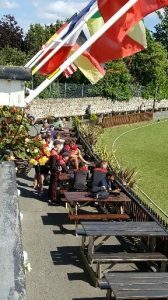 You may have noticed some of the photos were taken from the Clubhouse roof – I just want to ensure Robbie and our insurers that I was up there retrieving a cricket ball and it isn’t my new happy place at all. We are putting together a pilot project with Cricket Leinster and Heatley Tector to stream games live over the web. We hope to start with the Alan Murray Cup Finals Day games on 22nd July and to also show the Ladies Cup Final on 11th August. You’ll see Heatley around the place again (I’m thinking of charging a sub) poking at wires with Niall Walsh and I’ll keep you updated on developments. 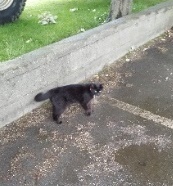 Anyone know who owns this cat? Black with a red collar its obviously a Pembroke supporter. Previous: Previous post: Club Clean-Up Day!